کیا, حامد. (1395). رخداد، توپولوژی و شکل‌گیری سوژه سیاسی. جامعه فرهنگ رسانه, 5(21), 81-100. حامد کیا. "رخداد، توپولوژی و شکل‌گیری سوژه سیاسی". جامعه فرهنگ رسانه, 5, 21, 1395, 81-100. کیا, حامد. (1395). 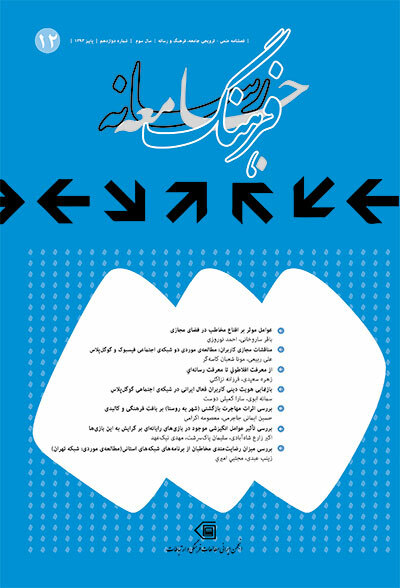 'رخداد، توپولوژی و شکل‌گیری سوژه سیاسی', جامعه فرهنگ رسانه, 5(21), pp. 81-100. کیا, حامد. رخداد، توپولوژی و شکل‌گیری سوژه سیاسی. جامعه فرهنگ رسانه, 1395; 5(21): 81-100. مقاله حاضر بررسی نظری مسئله شکل‌گیری سوژه سیاسی در زمینه‌ای است که نظم سیاسی گفتمان دچار رخداد می‌شود. برای این منظور، وضعیت انقیاد سوژگی در گفتمان را تحلیل خواهیم کرد سپس به مفهوم توپولوژی و رابطه شکل‌گیری سوژگی با دال‌ها و توصیف تخطی سوژه از قواعد گفتمان می‌پردازیم. بنابراین، تغییر در گفتمان بین سوژه و فضای پیرامون او در فضای توپولوژی شکل می‌گیرد. در این رابطه، سیاست را در دو وضعیت در نظر می­گیریم؛ 1- سیاست به‌عنوان نگاه دارنده وضعیت نظم گفتمان، و 2- سیاست در قالب تغییر وضع موجود و ایجاد نظم نوین. در نتیجه، رخدادها در نظم گفتمان آستانه تغییر را ایجاد می‌کنند. دال‌های معمول از معنا تهی و با مفاهیم جدید پر می‌شوند و به واسطه آن سوژه به گونه‌ای با بیرون پیوند می‌خورد که به ظهور سیاست‌های نوین دامن می‌زند. Agamben, Giorgio (1998), (Homo Sacer), California: Stanford University Press. Althusser, Louis (1970), Ideology and Ideological State Apparatuses, In: Lenin and Philosophy and other Essays (1971), (Ben Brewster Trans), New York and London: Monthly Review Press. Badiou, Alain, (2009), Logics of worlds being and event, (Alberto Toscano Trans. ), New York: Continuum International Publishing Group. Blum, Virginia & Nast, Heidi (2003), (Jacques Lacan’s two-dimensional subjectivity), In Mike Crang and Nigel Thrift (Eds.) Thinking Space, London and New York: Routledge press. Boucher, Geoff (2006) (The Politics of Performativity: A Critique of Judith Butler), Journal of Parrhesia, No.1: 112-141. Brown, Steven D. (2012), (Memory and Mathesis: For a Topological Approach to Psychology), Journal of Theory, Culture & Society, Vol.29, No. 4/5: 137–164. Buser, Michael (2012), The production of space in metropolitan regions: A Lefebvrian analysis of governance and spatial change, Journal of Planning Theory, Vol. 11, No.3: 279– 298. Butler, Judith (1988), (Performative Acts and Gender Constitution: An Essay in Phenomenology and Feminist Theory), Theatre Journal, Vol. 40, No. 4: 519-531. Butler, Judith (1997), The Psychic Life of Power, California: Stanford University Press. Corten, Andre´ & Doran, Marie-Christine, (2007), (Immanence and Transcendence in the Religious and the Political), Journal of social Compass, Vol. 54: No.4: 565–571. Cronick, Karen, (2002), (Community, Subjectivity, and Intersubjectivity), American Journal of Community Psychology, Vol. 30, No. 4: 529-564. Deleuze, Gilles (2006), (Foucault), (Sean Hand Trans. ), London: the University of Minnesota Press. Glynos, Jason (2008), (Self-Transgressive Enjoyment as a Freedom Fetter), Journal of Political Studies, Vol. 56: 679–704. Gilson, Julie (2011), (Transnational Advocacy: New Spaces, New Voices), Journal of Alternatives: Global, Local, Political, Vol.36, No.4: 288-306. Geniušas, Saulius (2008), (Self-Consciousness and Otherness: Hegel and Husller), Journal of Filosofija, Vol. 16, No.3: 27–36. Glynos, Jason & Stavrakakis, Yannis (2008), (Lacan and political subjecitivity: Fantasy and enjoyment in Psychoanalysis and political theory), Journal of Subjectivity, Vol. 24: 256–274. Gledhill, Christine (2003), (Genre and gender: The case of Soap Opera),In Stuart Hall (Ed. ), Representation (Pp.337-387), London: Sage Publications. Hall, Sturat (2000), (Who needs 'identity'? ), In du Gay,P.Evans,J. and Redman,P (eds. ), Identity: a reader (pp.l5-30) London: Sage Publications. Holloway, Julian & Kneale, James (2003), (Mikhail Bakhtin: dialogics of space), In Mike Crang and Nigel Thrift (Eds.) Thinking Space, London and New York: Routledge press. Howarth, David (2006), (Space, Subjectivity, and Politics), Journal of Alternatives, Vol. 31: 105–134. Humphrey, Caroline (2008), (Reassembling individual subjects), Journal of Anthropological Theory, Vol. 8, No.4: 357–380. Kirschner, Suzanne R (2013), (The many challenges of theorizing subjectivity), Journal of Culture & Psychology, Vol. 19, No. 2: 225–236. Lacan, Jacques (1997a), The Seminar of Jacques Lacan Book III, Jacques-Alain Miller (Ed.) (Russell Grigg Trans. ), New York London: Norton Press. Lacan, Jacques (1991), The Seminar of Jacques Lacan Book II, Jacques-Alain Miller (Ed.) (John ForresterTrans. ), New York London: Norton Press. Lacan, Jacques (1997b), The Seminar of Jacques Lacan Book VII, (Dennis Porter Trans. ), New York London: Norton Press. Lacan, J. (2006). Jacques Lacan and the Other Side of Psychoanalysis Book XVI (J. Clemens and R. Grigg Eds.). New York & London: Duke University press. Durham and London: Duke University Press. Laclau, Ernesto (1990), (New Reflections on The Revolution of Our Time), New York: Verso press. Lash, Scott (2012), (Deforming the Figure: Topology and the Social Imaginary), Journal of Theory, Culture & Society, Vol. 29, No. 4/5: 261–287. Lefebvre, Henri (1991), (The production of space), (Donald Nicholson-Smith Trans. ), Massachusetts: Blackwell press. Lury, Celia; Parisi, Luciana & Terranova, Tiziana (2012), (Introduction: The Becoming Topological of Culture), Journal of Theory, Culture & Society, Vol.29, No. 4/5: 3–35. Milovanovic, Dragan (1992), (Rethinking Subjectivity in Law and Ideology: A Semiotic Perspective), Journal of Human Justice, Vol. 4, No. 1: 31-53. Maffesoli, Michel (2004), (Everyday tragedy and creation), Journal of Cultural Studies, Vol.18, No.2-3: 201-210. Mubi Brighenti, Andrea (2011), (Elias Canetti and the counter-image of resistance), Journal of Thesis Eleven, Vol.106, No.1: 73–87. Nachtomy, Ohad (2007), (Possibility, agency, and individuality in Leibnitz’s metaphysics). The Netherlands: Springer Press. Nancy, Jean-Luc & Lacoue-Labarthe, Philippe (1992), (The Title of The Letter A Reading of Lacan), (François Raffoul and David Pettigrew Trans. ), New York: State University of New York Press. O’Sullivan, Simon (2010), (Lacan’s ethics and Foucault’s “Care of the self”: Two diagrams of the production of subjectivity (And of the subject’s relation to truth)), Journal of Parrhesia, No. 10: 51-73. Pluth, Ed (2006), (Lacan’s subversion of the subject), Continental Philosophy Review, No.39: 293–312. Savage, Mike (2003), (Walter Benjamin’s urban thought: a critical analysis), In Mike Crang and Nigel Thrift (Eds.) Thinking Space, London and New York: Routledge press. Sassen, Saskia (2011), (The Global Street: Making the Political), Journal of Globalizations, Vol.8, No.5: 573-579. Schmid, Christian (2008), (Henri Lefebvre’s theory of the production of space: towards a three-dimensional dialectic), New York: Routledge press. Sha, Xin Wei (2012), (Topology and Morphogenesis), Journal of Theory Culture Society, Vol. 29, No. 4/5: 220–246. Simonsen, Kirsten (2005), (Bodies, Sensations, Space and Time: The Contribution from Henri Lefebvre), Journal of Human Geography, Vol. 87, No. 1: 1-14. Tarde, Gabriel (1903), (The laws of imitation), (Elsie Clews Parsons Trans). New York: The Mershon Company Press. Verhaeghe, Paul (2006), (Enjoyment and Impossibility: Lacan's Revision of the Oedipus Complex), In Justin Clemens & Russell Grigg (Eds. ), Jacques Lacan and the Other Side of Psychoanalysis, Durham and London: Duke university press.